– Judgment in Hobbs v. Jones, a decision (available in full here), issued yesterday, in which a 4-member majority of the Arkansas Supreme Court ruled a 2009 lethal-injection law to violate the Arkansas Constitution; specifically, its guarantee of separation of powers. 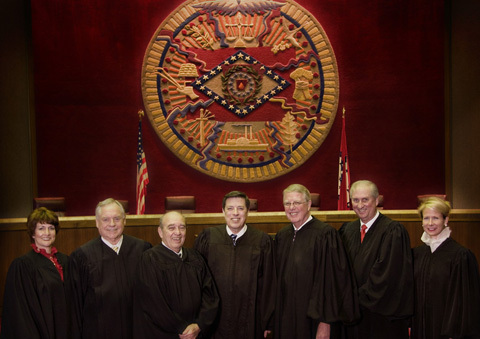 Justice Karen R. Baker (above at far left) wrote the 2-member dissent, while Justice Courtney Hudson Goodson (above at far right) voted with the majority. The judgment sends the fate of the 40 men now on death row in Arkansas back to the legislature.